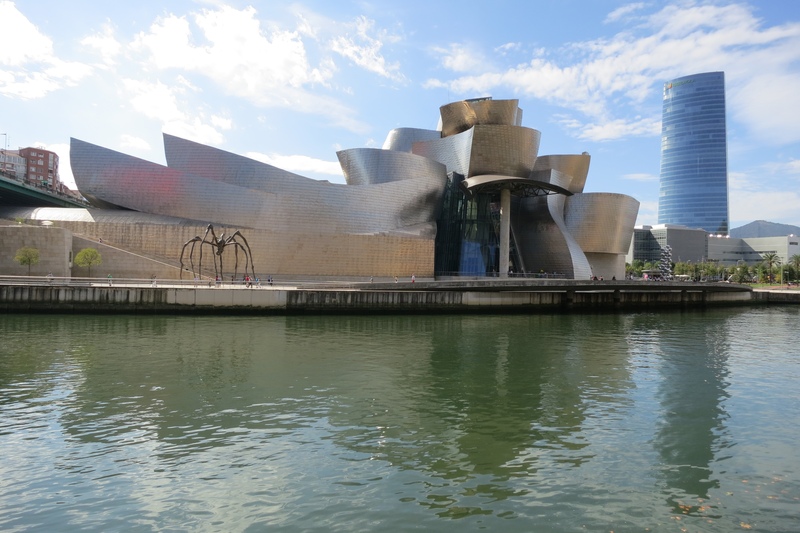 We had been in the north of Spain for close to a week – starting off in Basque Country, we had enjoyed the famous old town and pintxos of San Sebastián and the equally well-known San Mamés Stadium and Guggenheim Museum in Bilbao. The next stop was Asturias, in order to spend a couple of nights in Gijón. Being mid-week and pretty ordinary weather, the city struck us as a place that would be much better when visited in the middle of summer – clearly bad timing on our part. Fortunately, local CouchSurfer, Sonia agreed to meet up for a couple of hours on our last evening. Sonia took us to Plaza del Periodista Arturo Arias in the old town, an area traditionally inhabited by fishermen. The square is rich in history, including the fact that the executioner employed by former dictator, Franco once lived in the small stone house on the northwest corner. 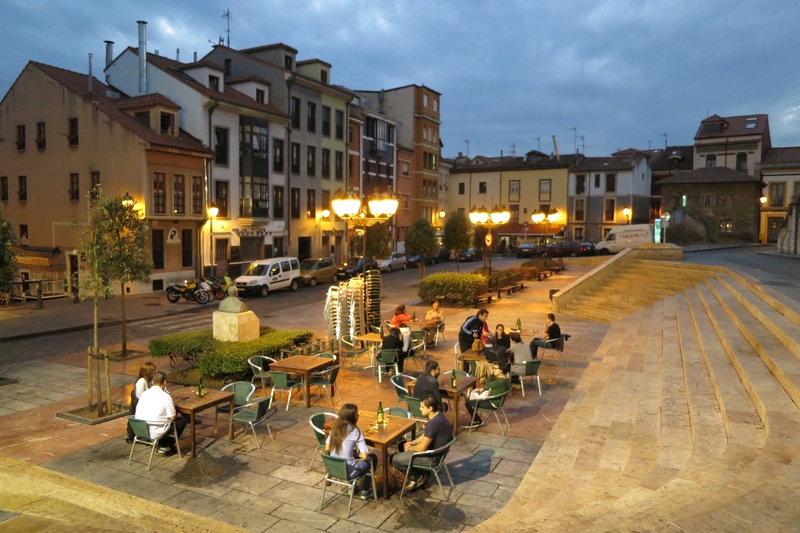 These days the square is home to 4 sidrerías (cider houses) and you will find young people drinking there on most nights of the week. Sonia explained that the sidrerías used to be considered lower class establishments, however with the fall in the economy, even posh people began to frequent them and now they are considered not just back in fashion, but as a symbol of Asturias. The flat cider needs to be poured from a height in order to oxidise it and the (roughly) 60mL serving should be drunk in one go, before the bubbles disappear. 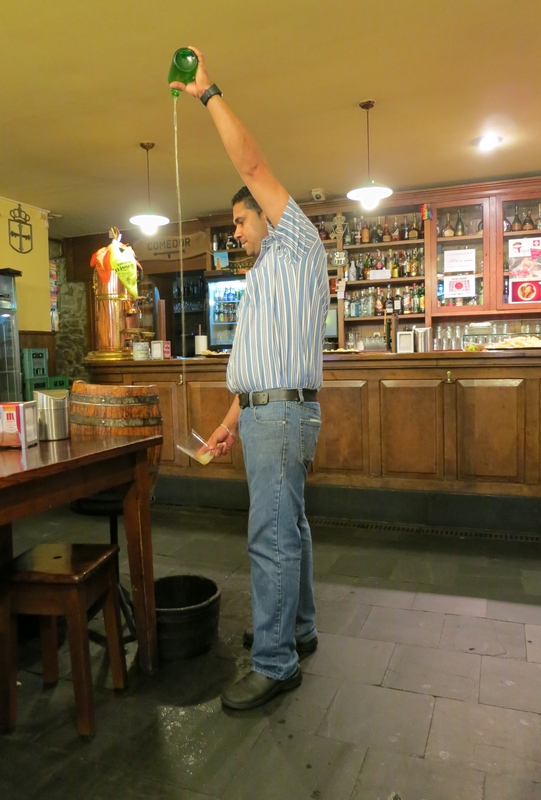 While the cider from these parts can be found in other areas of Spain, many locals believe that it loses its taste and goes bad once it passes over the mountains surrounding Asturias. When drinking with friends, the escanciador (pourer) is required to pour for everyone in the group, prior to drinking themselves. Generally, the group will drink from 1 or 2 glasses, with each person throwing out a small amount of cider left in the bottom of the glass, in order to clean the part of the glass they drank from. It is now law that bar staff pour inside the bar and punters pour outside, however 20 years ago, everyone used to pour their own cider inside the bars. Not even the woodchips spread over the floor could cover the dirt or smell from the inevitable spillage that occurred with each pour – this probably has a fair bit to do with the image that the sidrerías once had. What should have been a straightforward trip to Parapat turned into a 6-hour, 3-bus-change struggle, with an overturned log truck and cars in both directions trying to overtake the waiting masses not helping matters. The traffic in North Sumatra is enough to turn you to drink, however it had been a big enough struggle to find a cold Bintang in the highly Islamic Berastagi, let alone any craft beer. After a short wait in Parapat, we paid the $0.70 AUD ferry fare to cross Lake Toba, the largest and deepest crater lake in the world, to Samosir Island. The torrential rain had eased slightly by the time we arrived and we ended up walking to a guesthouse just outside Tuk Tuk, the main tourist area. After a pretty hectic day, it was off to a local bar after dinner for a few beers and some European Championship action. It was here that we were introduced to the concept of Tuak, or Palm Wine. While not exactly craft beer, our day was suddenly looking up. In this part of the world, Tuak originates from the Asian Palmyra, or Sugar palm and is produced by ‘tenderising’ the branch that holds the palm’s fruit and then slicing the skin so that the sugary sap drips down into a collection bucket. Each branch produces around 0.5L every morning and evening and can be used for up to 3 months. Once the liquid has been gathered, the bark of a certain tree found on the island is added in order to make it less sweet. The concoction is then filtered and drunk on the same day as fermentation begins immediately and the local Batak people prefer it fresh from the tree. A glass of Tuak will set you back around $0.20 AUD and three glasses will apparently give you the same feeling as a small bottle of whiskey, however you won’t suffer from a hangover if you get it from one of the decent producers. The next evening we were taken off the tourist trail to a Tuak House in the foothills behind Tuk Tuk, but it was clear on arrival that we were too late to purchase any ourselves, with the locals in fine form. Luckily someone managed to find a glass for us to test it out and we have to admit that it’s pretty good. Rice wine is probably the most similar thing we can think of in terms of taste and consistency. 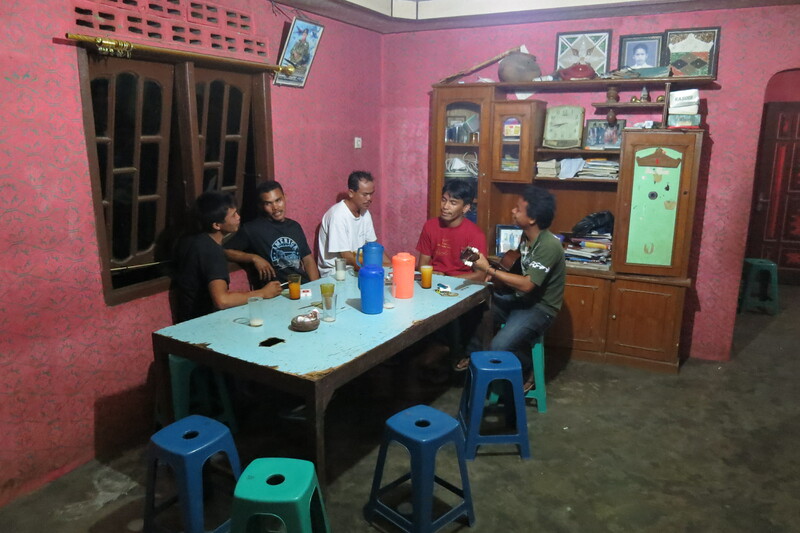 Tuak is a very social drink, with groups of people gathering at the end of each day to either talk or play some music. Craft beer or not, it certainly was a different experience to sit on the edge of the jungle just after dusk, sipping on our first Tuak and listening to the locals sing Batak love songs.